Plot: Caroline Ogdon (Harding) is the daughter of the towns wealthy banker (Walter Walker) & in love with a bank clerk, Roger Standish (Dix). Her father disapproves of their relationship, so the couple heads west to start a new life. One the way they are attacked and Roger is shot defending Caroline. Taken to a small town Roger is saved by a drunken doctor (Kibbee) & nursed by his super tolerant wife (Oliver). While recovering, Roger tries to organize a posse to go after the bandits that robbed the town, who just happen to be the same men that shot him. Too weak to ride, he nonetheless inspires the men to capture & hang the bandits, the incident giving him the idea to start a bank to protect the townspeople’s money. The bank is a big success & Roger becomes a leader of the town. Caroline is the supportive wife & bears Roger twins, a boy and a girl. As the town also thrives, Roger uses his influence to bring the railroad through town, but as the first train arrives tragedy strikes and the couple’s son is killed. Roger & Caroline are heartbroken, but pour all their love into their daughter Frances (Haydon), who grows into a beautiful woman. She is courted and marries a clerk (Donald Cook) in her father’s bank, not met with the same derision as her mother when she courted Roger. The combination of a bank panic & risky investments by the son in law drives Roger’s bank into dire straits, which triggers the son-in-law’s suicide just as Frances gives birth to a son, Roger Lennox. Standish is forced to confront a depositor who has lost all his money, giving him a chance to explain (to depression era audiences too) why the banks are important to the country. Caroline mediates between the two and Roger lets the man go, promising to return all the depositors money, if only granted time. 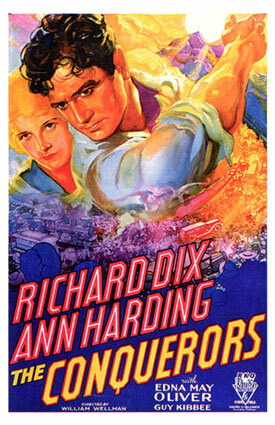 Thoughts: The Conquerors was one of 18 pictures that Wellman directed for Warner Bros in a 3 year period from 1931-1933. In several of the pictures the depression is dealt with head on as it is in The Conquerors, however, the expanse of the timeline in this movie sets it apart. As if trying to cast the depression in the context of the normal ebb & flow of the economy, The Conquerors has at least 3 “bank runs” over the course of its 50 year story arc. In each run, it is the American spirit, embodied by Roger Standish/Roger Lennox, that looks failure in the eyes and putting faith in the people and the institutions that make our economy thrive. In each case he is richly rewarded because he is good, unlike his father in law, who in his unscrupulousness is driven to ruin & suicide. The conquerors, America, can beat anything, financial ruin, Westward migration even the death of family, so long as we have courage. A heartening message of hope for viewers in 1933. Warner Bros, under the production guidance of Darryl Zanuck (1931-1933), was known as the studio that dealt most directly with social matters and social message pictures. The Conquerors fits in some degree in that milieu, although most typically the Warner movies of the era were based in the streets and not in banks and mansions. The early scenes of Roger & Caroline struggling while Roger recovers from his gunshot wounds, Caroline scrubbing floors are more typical of the Warner environment. The short episode when Roger is at war, is an interesting reflection of Wellman’s own experiences in World War I, right down to the number of German planes Roger is credited with shooting down. Wellman, like Roger, joined the Lafayette Flying Corp, flying for France and earning great distinction in shooting down 3 German planes, while earning the nickname that stuck with him throughout his life, wild Bill. A small line in the film also echoes Wellman’s experience in the war when Aunt Matilda wonders who will keep the French maidens away from Roger. Wellman himself was secretly married to a French woman, Renee, who would be killed later in the war. His marriage to her was kept secret for most of the rest of his life.